click and hold your mouse over this image to scratch off the ticket. Slingo is going pro. 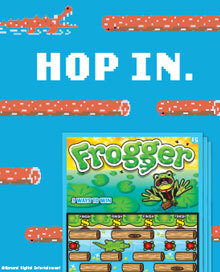 It’s the all-star version of the popular game that features bingo and slots, hooping it up this spring with basketballs, backboards, and megaphones! Jersey up and get in the game, where you could be the biggest pro-all-star and win $50,000 playing Slingo Pro! 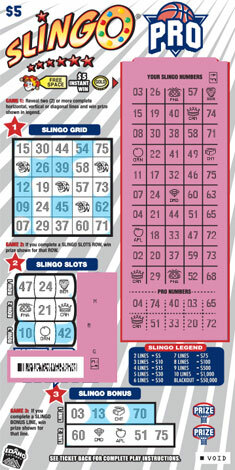 Slingo Pro plays like a traditional Idaho Lottery, $5 Slingo game. Players scratch YOUR SLINGO NUMBERS and the bonus PRO NUMBERS. Players then match those numbers to the numbers in Game 1, Game 2, and Game 3. Players who reveal two (2) or more complete horizontal, vertical or diagonal lines in Game 1 win the prize shown in the legend. In Game 2, players who complete a SLINGO SLOTS ROW, win the prize under the corresponding basketball for that ROW. In Game 3, if a player completes a SLINGO BONUS LINE, they win the prize shown for that line under the Prize basketball backboards! Jokers are always free spaces and gold coins in YOUR SLINGO NUMBERS always win $5. It’s Slingo Pro. Go “Pro” and your payday could be a $50,000 bonus! *Real time data on prizes below $25 are not available.